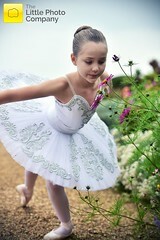 If you live in the U.K. area and are wondering where to find children’s dancewear for ballet, the choice is obvious. 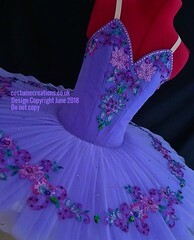 Go to the most experienced maker of ballet costume designs for girls in the area; Costume Creations U.K. Wearing a professionally made ballet garment is an experience that any dance-loving girl will always cherish. As a parent with children immersed in the world of the performing arts, I am sure you want the very best apparel for your child’s rehearsals and competitions. That means avoiding cookie-cutter apparel and investing in dancewear that has a reputation for quality, fit, craftsmanship and theatrical styles appropriate for younger ballet students. 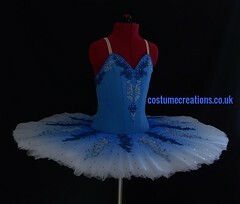 Online, there are ballet costumes for kids and there are costumes for children’s ballet performances. The two types of designs are very different. One requires the commission of a designer that specialises in the construction of made-to-order ballet garments for smaller dancers. The other styles are for home play and dress-up games. If you are a first-time visitor to this blog, you may be surprised to see just how young some of these ballet students really are. Winners usually have a few things in common. They persevere even when the going gets tough. They are willing to sacrifice play time to achieve a goal. Above all, they must have confidence and believe in themselves. Since young children studying dance need to learn confidence, a great booster is the way they look and feel in their costume. Looking your best in a garment that moves right along with you is only one perk when it comes to couture dancewear. The confidence can also come from knowing that you are treating yourself to the best money can buy. There is nothing wrong with feeling like a pampered princess whilst your designer is hard at work making you an original design people are going rave about. You are worth it! To be en l’air is even more thrilling as a young dancer when you can show off your technique in a beautiful pale pink ballet costume made just for you. 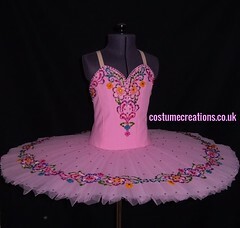 It can be lots of fun to look at all the styles of costumes that are available for your ballet debut here on Tutu-Love, but your design will always be made with just your personal needs in mind. Doesn’t that sound delicious? Visions of dancing sugar plums and other magical things are right here in this colourful, majestic tutu design for little girls. The two-toned airbrushed style has fantastic stage appeal and the happy look on the wearer’s face speaks volumes about customer satisfaction. 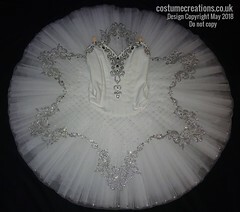 This tutu is a real beauty of a garment for a young ballet dancer. How can something be adorable, inspiring, cute and gorgeous all at the same time? Easy if what you are looking at is a photo of a tiny ballerina wearing a stunning stargazer of a ballet costume. This photo is a great example of the polished, professional appearance a child can attain by the right choice of costume designer; in this case, Costume Creations. You may be pint-sized, but you will get the same high-standards of service as the taller, older girls when you arrive for your fitting and consultation. Fresh, bold and feminine shades of bright turquoise and white make a wonderful airbrushed tutu design for youth ballet performances. Because each tutu is personal and unique to the wearer, you will not find two that are exactly alike anywhere in this world. This one has amazing visual energy through the clever use of colour. This young ballet student adds her own youthful enthusiasm to the costume aesthetics making this image one that she and her family will treasure forever. Although photographs of very young dancers always tug at the heartstrings, they are much more than just cute images. A child wearing a professional garment presents a polished appearance that is very far from the typical appearance of a child that age. This proves that beauty comes in many different age categories. 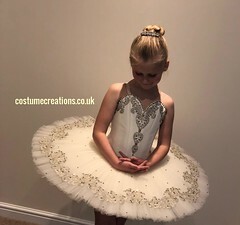 As you can see from the small collection of tutus featured here, Costume Creations U.K. has the know-how to get the details right no matter the age or size of the dancer. 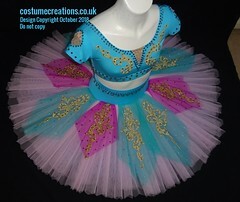 The Gallery On Costume Creations-See Unique Children’s Dancewear U.K.
Have you ever visited the tutu gallery on the Costume Creations website? It is a wonderland of beautiful styles and creative construction methods that any dance lover should not miss. The most amazing quality about each and every one of these designs is that they are all made by hand and are 100% original ballet couture. 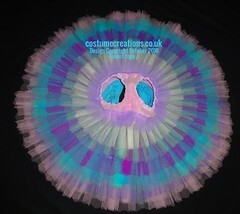 Visit the tutu gallery to see the variety of designs that have been made for dancers throughout the U.K. and surrounding areas. Just like nature creates snowflakes where no two are exactly alike, so are the tutus from Costume Creations; hence the explanation for the snowflake at the top of this page. © 2010-2015 Tutu-Love, Copyright Images & Content. All Rights Reserved. 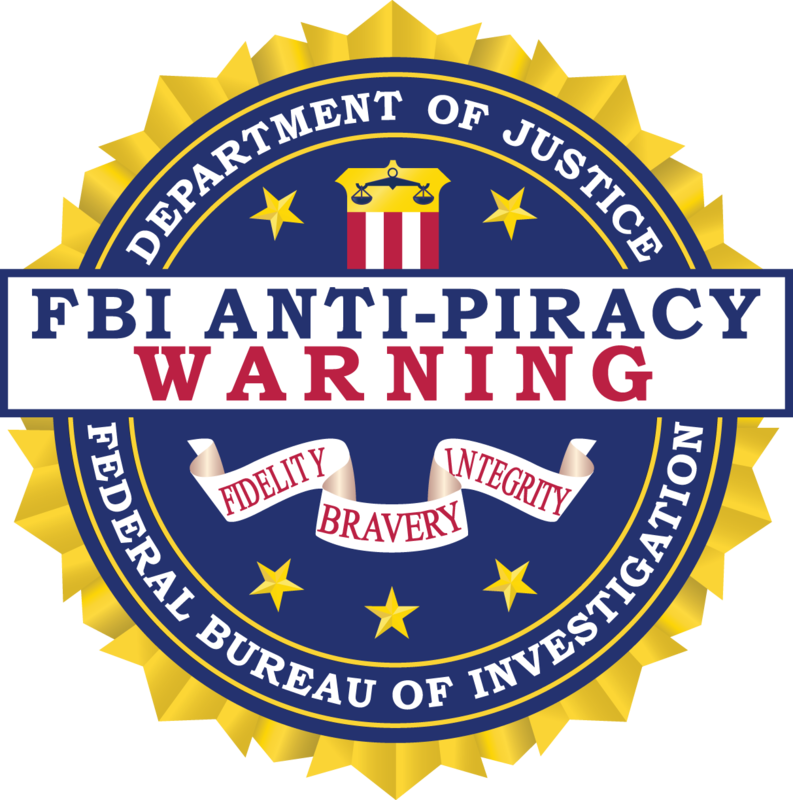 Do Not Copy. Wishing you the best, let me introduce myself. My name is Marcos Valle López and I am the director of the non-profit Arabesco Dance Academy in the northern city of Matagalpa, 130 kilometers away from the capital of the country, Managua, Nicaragua, Central America. The reason why we are addressing you is to request a donation or sponsorship for a tutu ballet and custom children and young ballet. for our students . They are childrens and young. We started operating as a non-profit dance school a few years ago, hoping to interest the people of Matagalpa and surrounding area in the fine art of dance. My wife and I have been struggling along, doing our best to train young people and we haven´t received any support from the government and very little from private enterprises. We live in a time of recession in our economy, so funding has been scarce and disperse. Nevertheless, we have continued along trying to establish a series of events and courses through all these years. Dear Marcos thank you for your contact – I am sorry I am a very small business, my parents all work very hard and go without to afford costumes. It would be very unfair of me to donate costumes to a school I know nothing about. Any NATIONAL BALLET SCHOOL would give a scholarship to a talented child regardless of what they wear. 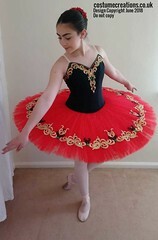 A tutu is a nice treat for a performance – it is not a necessity. I too am basically non profit – and all of us are living in recession here too. This is very true what you say about how confidence is so important for young dancers – it is essential that they are happy and comfortable in what they are wearing.